Yep, you heard it, Dorito Chicken. Not every day is a healthy day and when you’re going to drink copious amounts of margaritas and inevitably wear a stranger’s sombrero you might as well coat your chicken in crushed up Doritos! Cinco de Mayo foods have stepped their game up and as an adult I feel like I need an actual plate of food vs. being 22 and consuming nachos and quesadillas for dinner. This meal is excellent for Cinco but also a nice change on Taco Tuesday, I fully believe the Doritos act similarly to a Taco shell in the crunch department, and if you serve it with cauliflower rice it’s still low carb….isn’t it? No? Well accept that life is about balance and this isn’t the chicken you eat every day, and simply ENJOY IT! Set up a breading station using paper plates and a shallow bowl, add the flour to one plate and the crushed Doritos to the other and put the shallow bowl of egg wash in the middle. Prepare a shallow baking dish (I used a 13x9 glass pan) with cooking spray. 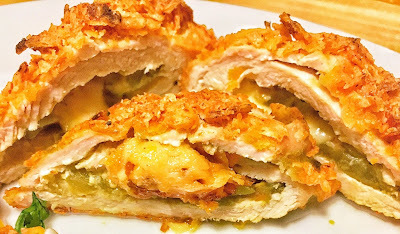 Lay the pounded chicken cutlets out and add cheese across the width plus a table spoon of green chilies to each cutlet. Season with salt and pepper and roll up. Set aside seam side down. Repeat as needed to finish the chicken. Take each roll up and roll it in flour and then egg wash, remove extra egg wash and press the Dorito coating onto each roll up and put seam side down in the baking dish. Repeat as needed to finish the chicken. Spray across the top of the chicken with non-stick cooking spray. Bake until the internal temperature is 165 degrees, you don’t want to throw up tomorrow right!? (Well from salmonella that is, you’re too old for Jose Cuervo!) Let cool 5-10 minutes before serving as the cheese will be like delicious molten lava. I really enjoyed making this as a fun spin on something I normally do “naked” or just rolled with cheese and covered in green chilie salsa, adding the crunch of the Doritos was perfect and something totally different for my guests! This paired very nicely with the Mexican corn off the cob, lime zest cauliflower rice (simply add some lime zest and salt to cauliflower rice) with black beans and Cotija cheese. I like using paper plates for my breading station because it makes clean up a breeze!!! If you end up having a shortage of Doritos while breading simply crunch more up, but make sure to use a clean hand! If you like spicy food and want to kick the heat up, you can use diced pickled jalapenos in place of the green chilies but I thought this was just spicy enough!